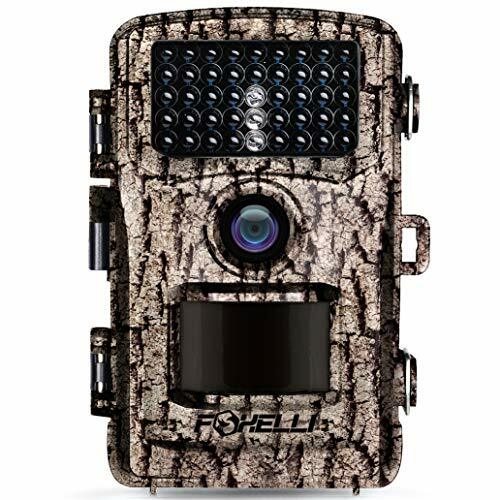 The Foxelli Trail Camera is an excellent first cam for a novice. The camera can give up until 12mp for photos which can provide sharp, detailed and incredibly vibrant photos. The video settings can be set up until 1080p, and you record a video up until 10 minutes long, it is also complete with sound so you can both see and hear your recording. These features make you get a fantastic view on what you have recorded. Take note that the images and videos that will be captured during night time would be black and white, in the daytime, it will be in full color. The camera is also built in with a pair of 120 degrees wide lens that offers a huge shooting scope that can capture stunningly beautiful wildlife. It also built in with a 2.4″ LCD color monitor. This monitor is primarily used for previewing photos and videos, camera targeting and the browsing menu. These functions make the camera much easier use- not to mention it makes it user-friendly. No need to worry about being too late or missing a moment of wildlife because the camera is also motion-activated. It can handle up until a rather impressive 65ft detection range. This, and with a PIR of 0.5 seconds in trigger time, it will be hard to miss anything that moves within its immediate vicinity. There are also different kinds of settings in the camera that will allow you to max out the quality of your pictures/videos. The quality would depend significantly on where you are, the weather, and its usage. The camera is also equipped with 42 IR LEDs.It will provide lighting that would be incredibly useful whenever the camera is being used at night. All of its settings are adjustable and can be seen in the instructions. Not to mention its user-interface is incredibly easy to understand. Although, the keypad can use some improvement as it’s hard to engage without the use of your fingernails. Camera is incredibly durable and waterproof. Settings are innovative and easy to configure. Camera is easy to set up. Outstanding video resolution both during day and night time. Excellent picture quality both during day and night time. Has a USB cable included. Batteries, AC Adaptor, and Memory card are not included. Can only use Micro SD cards. Keypad is hard to use. The camera has excellent resolution and quality that will help in capturing the beauty of wildlife. It gives many kinds of features that will be very helpful for the user. Its durability will make it last longer and become more worthwhile. You can use the camera in any way you may see fit, and you can configure it in any way you want. It’s easy to set up, and the interface is user-friendly. The camera’s design is very compact, all functions and features work as described. Although, the product does have a couple of setbacks. Namely, not having any power source can be a real issue when you’re always on the go. The Micro SD card is also not included in the box- and you can’t use any other type of memory card but this. There are also occasions where the camera freezes, refuses to work, and crash. Take in mind to use the video feature sparingly unless you have the AC Adaptor. There are many pros and cons to this product; therefore it is highly recommended to think about it carefully and with consideration before buying one.